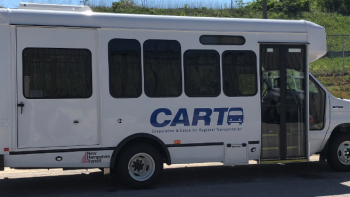 CART has several Shuttles with Route Deviation service, which means the Shuttles will run a regularly scheduled route of stops and will also “deviate” to pick-up and drop-off riders within a quarter mile radius of the route. Riders must call ahead to schedule a route deviation ride. Round-trip route deviations are allowed for pickups at residences only to drop-off locations indicated on the schedule and the return trip must be from original drop-off point to original pick-up location. Passengers are asked to be ready 10 minutes prior to scheduled pick-up time as the bus cannot wait. Deviations upon demand will not be honored. All route deviations must be pre-planned to provide maximum seating capacity for the general public. Flag stops or hailing from the street is not allowed. 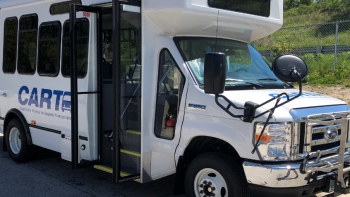 The Derry/Londonderry Shuttle is provided by CART to provide regular access to shopping, nutrition and medical facilities for seniors, those with disabilities, and the general public as space allows in Derry and Londonderry. The service runs as a demand response route deviation service with regular service to senior meal sites, shopping centers and medical destinations. There is NO FARE for the Derry/Londonderry Shuttle. The Derry/Londonderry Shuttle is the combined effort of CART, Rockingham Nutrition Meals on Wheels, and Easter Seals NH. The service is funded by CART with federal grants and a grant from the NH Department of Transportation. The Hampstead Shuttle operates similar to the Derry/Londonderry Shuttle, serving residents of Hampstead. There is NO FARE for the service. 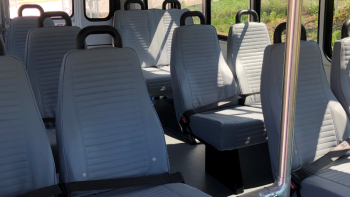 The Salem Shopping Shuttle provides a regularly scheduled public transportation route to shopping destinations from senior housing and the Ingram Senior Center in Salem. The Salem Shopping Shuttle is available to the general public and is a route deviation service, which means it runs a regularly scheduled set route of stops and will also “deviate” to pick-up and drop-off riders within a quarter mile radius of the designated route who have called ahead to schedule a ride. There is NO FARE for the service. There is no fare for these Shuttle services, however, donations are needed and are an integral part of sustaining the service.